Yet it would long remain a popular subject of discussion among researchers. Scientists now suspect that emissions containing fluoride and unknown metal dusts from the U.S. Steel plant strongly contributed to the fog that killed at least 20 people, giving the borough the distinction of being home to the nation’s deadliest air pollution event. It’s an untested theory, though, because researchers into the disaster over that Halloween weekend face two obstacles: vital coroner files involving the victims have never turned up and the company claims it no longer has any records about the mill. The borough along the Monongahela River south of Pittsburgh similarly wanted to forget about the smog that stained its reputation for the next five decades after the event captured headlines across America. Following a brief shutdown while the air cleared, the steelworkers returned to the routine of making steel in a place that was much like its sister mill towns that dot the river valleys from Pennsylvania to the Mississippi River. Donora’s main street, like its neighbors, grew to become lined with ornate storefront buildings owned by grocers and clothiers who sponsored summer festivals, parades and sales to collect their share of mill workers’ paychecks. There were at least four Roman Catholic ethnic churches and three times as many social clubs where immigrant families passed along their traditions from such countries as Russia, Italy, Slovakia and Poland. Combined merchant sales in Donora topped $3 million in 1935 among its 147 businesses. The town had 92 grocery stores that reported $1.1 million in sales that year. 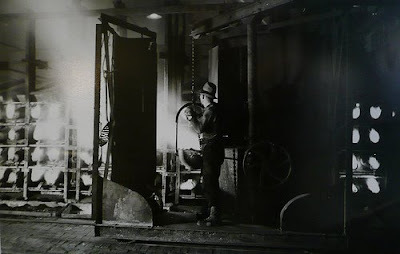 The community weathered intense strikes, booms in production during two World Wars and layoffs when the demand for steel declined. But they were given 10 percent increases in pay in November 1936, taking their wages from 47 cents per hour to 52 1/2 cents per hour. As labor’s efforts to unionize intensified in 1936, the company offered five percent raises if the cost of living index rose by 10 percent. There was hope everywhere for better days to come in the borough. “The Donora Steel and Wire Works is proud of its production achievement, especially during the war years when all facilities were utilized for producing war materials,” the company proclaimed in a pamphlet it published for an open house in 1948 that took place before the smog. Visitors learned the plants were laid out to allow the smooth flow of steel from the blast furnaces at the southern tip of town to become finished products loaded onto rail cars at the competing end of the mill. The plants had the capacity to produce 476,000 tons of hot-rolled rods a year, along with 260,000 tons of bright wire annually. “More coal is consumed in the mill in one month than what is required for heating 1,700 average family residences for a year,” the pamphlet boasted. No doubt, the black coal smoke also contributed to the thick smoke that caused people to gasp for air during the smog that would come to be cited as reasons behind the nation’s first clean air legislation in the 1960s. But three years after the deaths, however, local historian John “Moon” Clark chose to omit any mention of the tragedy in a story he wrote for the Donora Jubilee, a magazine that celebrated the borough’s golden anniversary. In an advertisement in the booklet, U.S. Steel selected to offer its “sincere hope” that it would be around and flourishing for another five decades. But that would end up being just another unfulfilled promise from the industry. Mill founder Frank Donner had even boasted of creating 10,000 jobs in Donora, a number than never materialized. Employment did peak at 7,000 after the zinc mill opened in 1915. For its remaining life, the plants employed between 3,000 and 5,000 workers, depending on the economy. As 1960 approached, the men would need to grow accustomed to punching fewer and fewer hours into the time clocks.